24 volt to 12 volt DC/DC converters 60 Watts and 120 Watts, 10 and 15 amp peak 24V/12V. 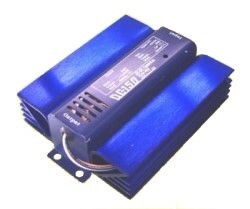 High power 24 volt to 12 volt DC/DC converterzs at low cost. These are regulated switching power converters, designed to allow the use of 12 volt equipment in 24 volt vehicles. These are attractive, reliable, robust DC/DC converters good for fork lifts, off-road, construction and recreational equipment. Those that are listed as "forced air cooling" should be protected from water, spray, and dust that could be sucked into the power supply. This DC/DC converter has two power supplies. The main one is a 10 amp, 13.8 volt output. 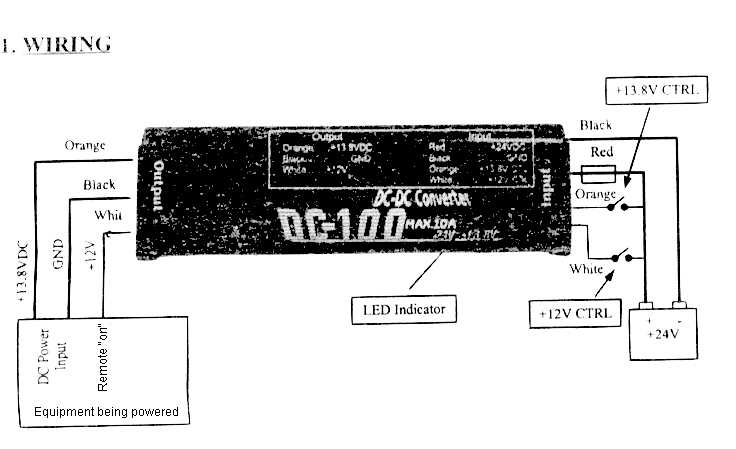 The secondary one has a 12 volt, low current output. The purpose of the secondary circuit is to turn "remote turn-on" units that need 12 volts applied to a switch to turn on. Many applications don't need this output. The white 12V output will not turn on unless the main orange input is already on. The input has four leads. The black goes to chassis or battery ground. The red wire goes to battery positive (+24 volts). The white input wire is a control wire. To turn the unit on the white wire must be connected to +24 volts. This can be done by wiring it permanently, or it may be connected through a vehicle key switch. The orange wire is also a control wire. It can be attached to +24 permanently by hard wiring, or through a switch. If the low current 12 volt output is not required, the orange input wire may be tied off or connected to the white wire input. The main power leads are the white and black. White is the +13.8 volt output, black is the ground. If required the orange 12 volt output can be used as a remote turn-on switch supply. If not required, it should be tied off in a way that it wont short to chassis. Often it is desirable to run 12 volt equipment on a 24 volt wheel chair. For example, a laptop computer, a car radio, or a seat pump. It is not wise to do this by simply connecting across one of the 12 volt batteries. This causes the batteries to be out of balance, and then during the charging process one of the batteries will be over charged while one will be under charged, limiting the life of the batteries. A good solution is to use a DC/DC converter to convert the 24 volts to 12 volts. An automobile cigarette lighter socket, which is available at Radio Shack, makes a convenient 12 volt power point to wire the DC converter output to. For a permanent installation, such as a seat floatation pump, the DC converter can be wired directly to the pump, bringing out the orange control wire to a switch if desired. 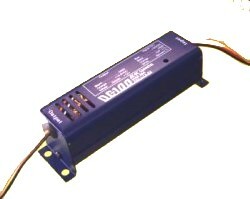 The DC converter has a mounting flange with four self-tapping screws included. To determine the amperage you would need add up the watts of all the equipment and divide by 13.8 volts. Samples and retail sales are available for those listed as "in stock." Minimum purchase quantities apply for the others. These are also known as 24 volt voltage reducers, and voltage regulators.